Rather than marking one specific moment in time, like a belief or a deeply-held wish that has been expressed and then apparently abandoned, some ancient sites have evolved slowly over thousands of years – and are, in fact, still evolving. 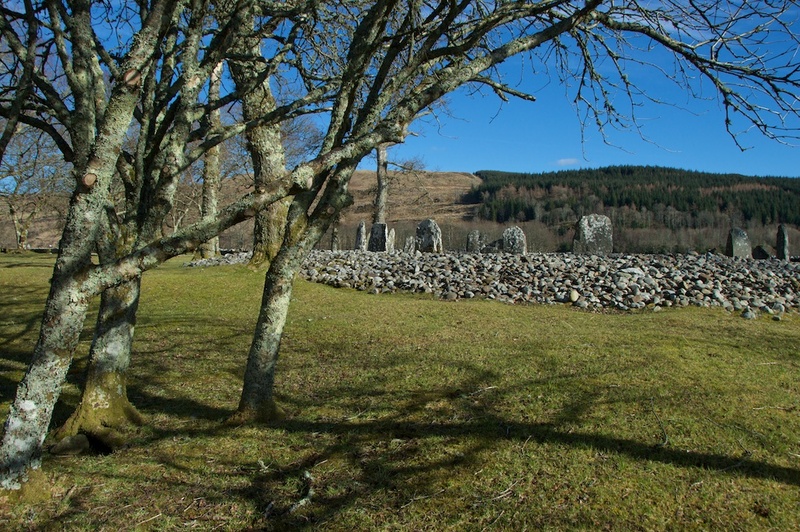 For archaeologists, places like Temple Wood in Kilmartin Glen must present an ongoing headache. Instead of a few scattered pieces of the same jigsaw, they are working with the fragments of different pictures, spread over a time span of about 2,000 years, mingled and overlapping, and garnished with a generous topping of Victorian romanticism. 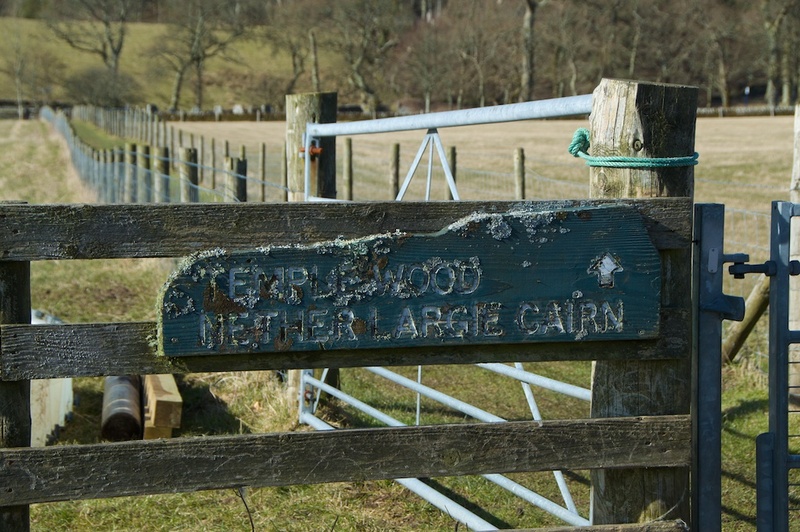 It’s thought that Temple Wood began life around 3500 BC, as a circle of upright timber posts. Then, around 3000 BC, the posts were replaced by a setting of at least five stones. There’s a suggestion that this construction was never finished. 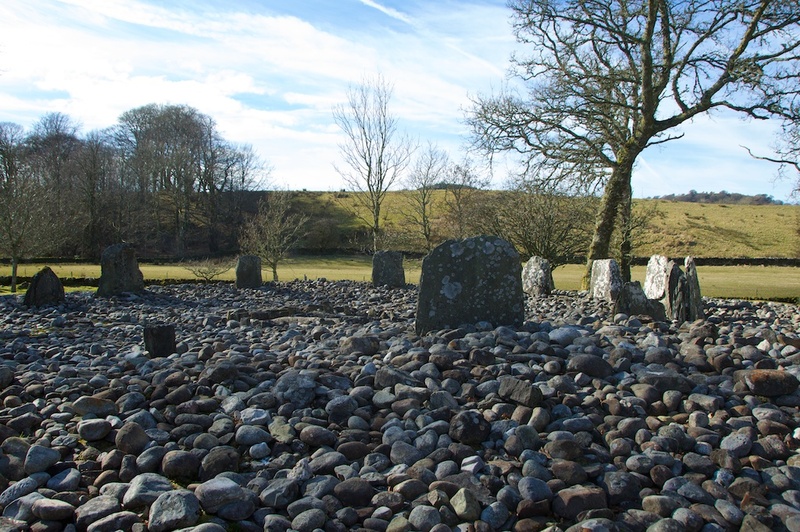 For some reason which we may never fathom, but which I’d love to know, “at some date after 3000 BC” another stone circle was set up a few yards to the south-west, adjacent to the first one. 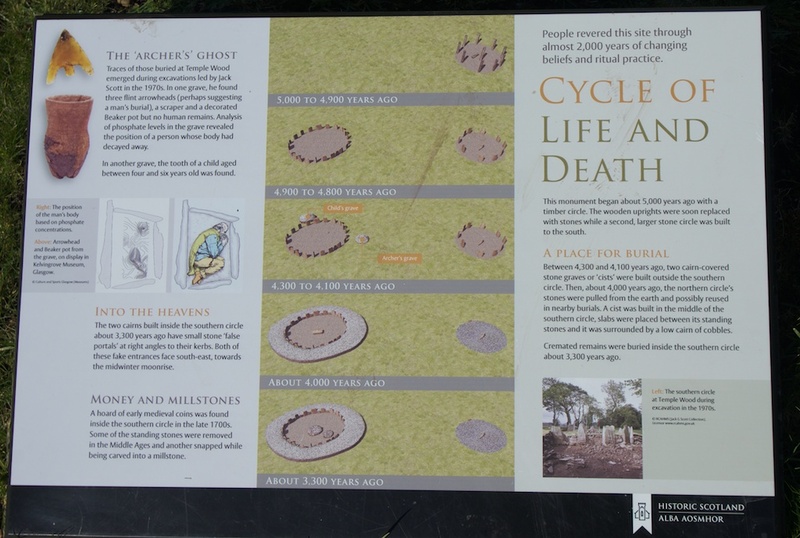 The information sign at the site suggests that for some time at least, the two circles existed side by side, before the first one was deliberately dismantled and covered with a layer of cobble stones. 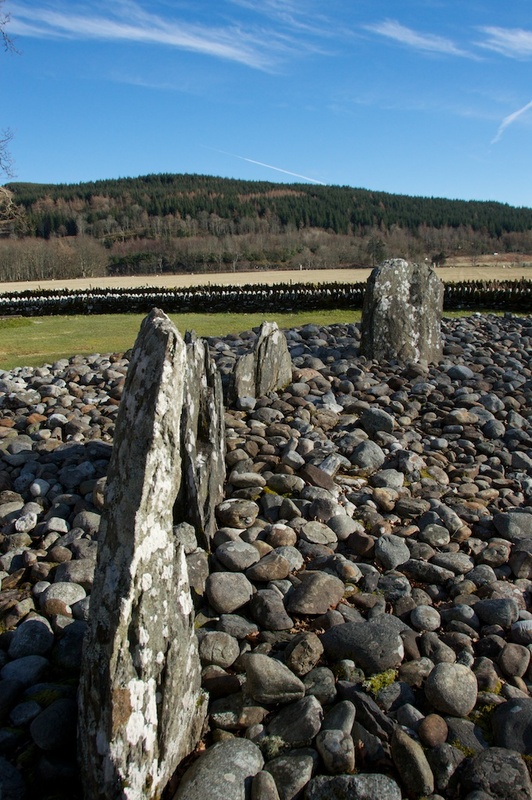 The second circle is, in fact, slightly oval in shape, and originally consisted of 22 upright stones, of which 13 remain. For the first few millennia, it seems that Temple Wood’s only purpose was as a ritual site. 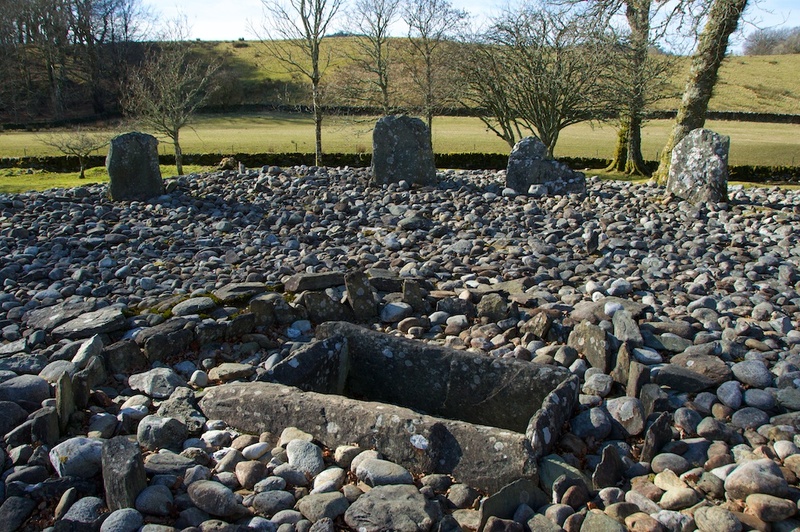 But around 2000 BC, two small burial cairns were dug outside the second stone circle, and over the centuries more burials were placed inside the ring of stones. 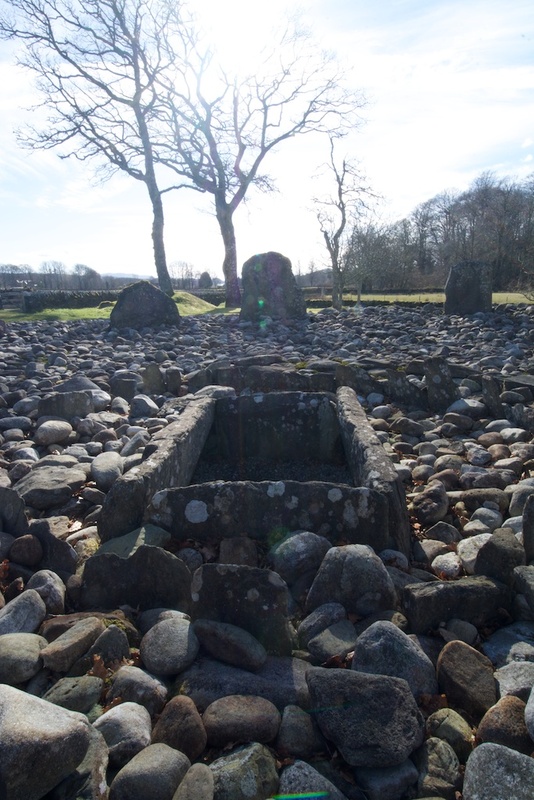 The central box-shaped cist is still a striking feature. 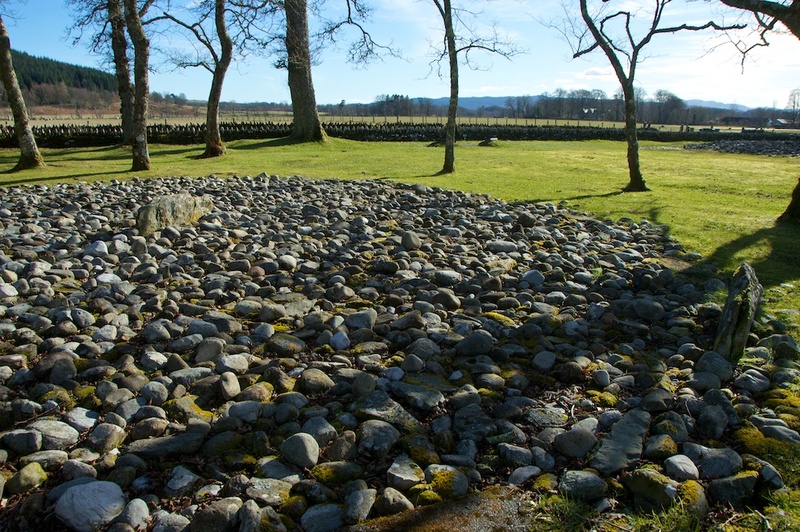 At some stage, it was decided to surround the perimeter of the circle with a bank of cobbles, held in place by slabs that connected the stone uprights to form a complete ring. 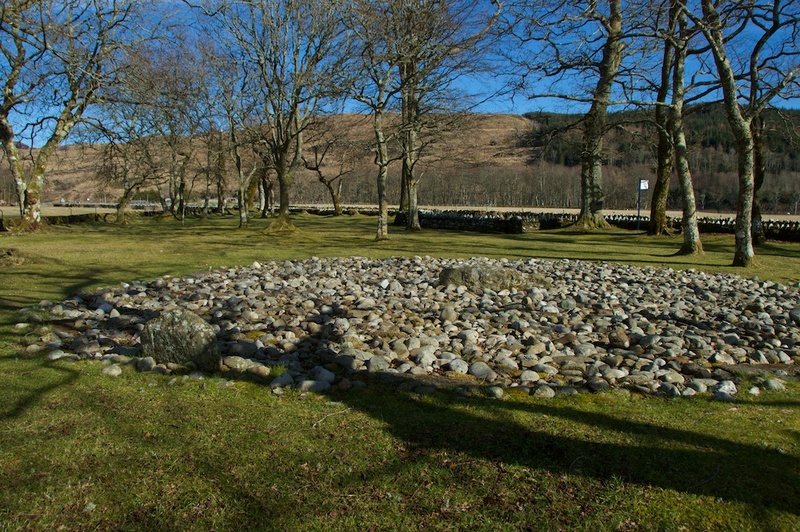 This band of cobbles would have covered the two outside burial cairns, as shown on the Historic Scotland information board (below). Historic Scotland’s sign alludes to the ‘archer’s ghost’, which is enough to set your mind racing, but this turns out to be speculation about the owner of the flint arrowheads, referring to the fact that his physical remains have completely disappeared. The database of the RCAHMS states that an axe-head is carved on the head slab of the cist within the circle. This is later described as “unrecognisable”, which is a relief to me, as I certainly missed it. Other carvings are recorded, including a “magnificent” spiral on one of the outer stones, and there is mention also of a concentric circle and cup-marks. 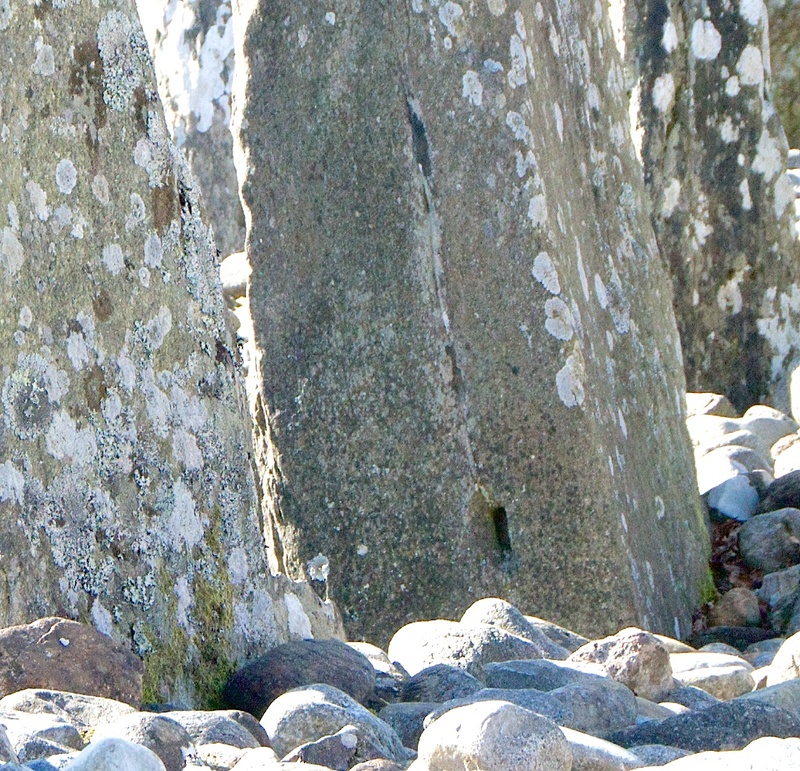 These would be hard to spot, as the stones are covered in lichen. The spiral is carved on the face of this stone, somewhere just above and to the left of the lower hole. It was in shadow at the time of our visit, and no amount of photo-editing will show it up! 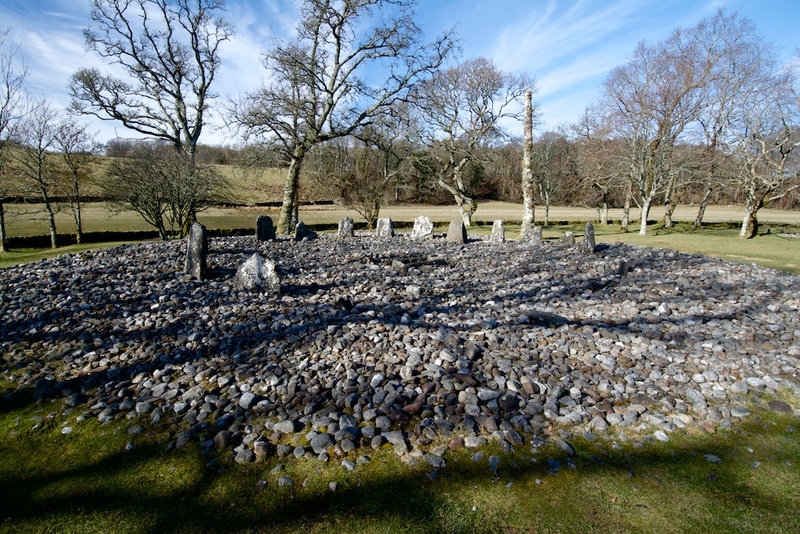 Looking south-west, a line drawn through the centre of the two circles and the north-east cairn points towards the midwinter sunset; lunar alignments have been described, but these are quite complex and include the Nether Largie stones, in a field close by. They are best seen in a diagram, and you can read more in the excellent article ‘Recent Astronomical Observations at Kilmartin Glen‘ by Doug Scott in ‘Antiquity’. Peat began to form over the site in the second millennium BC, and Historic Scotland believes that by 1000 BC it had been abandoned. In the 19th century, a ditch that was made to assist peat cutting may have traced the line of a much older ditch, and it’s possible that the activity also aroused the interest of amateur historians. A report from the early 1800s suggests that a cache of coins, possibly medieval, was discovered within the “Druidical Circle”, but these disappeared, no doubt into eager hands. 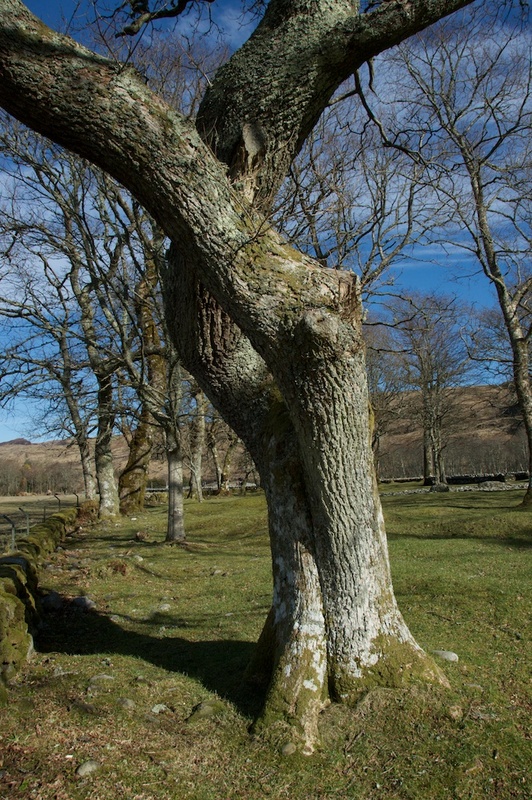 Later in the 19th century the local landowner, Sir John Malcolm, decided to plant oak trees around the site, presumably to enhance its appearance, and it was he who named it ‘Temple Wood’. That is interesting, as I always thought it was an ancient name. It’s difficult to imagine these distant periods of prehistory with any kind of definition: it’s the time factor that gets in the way. 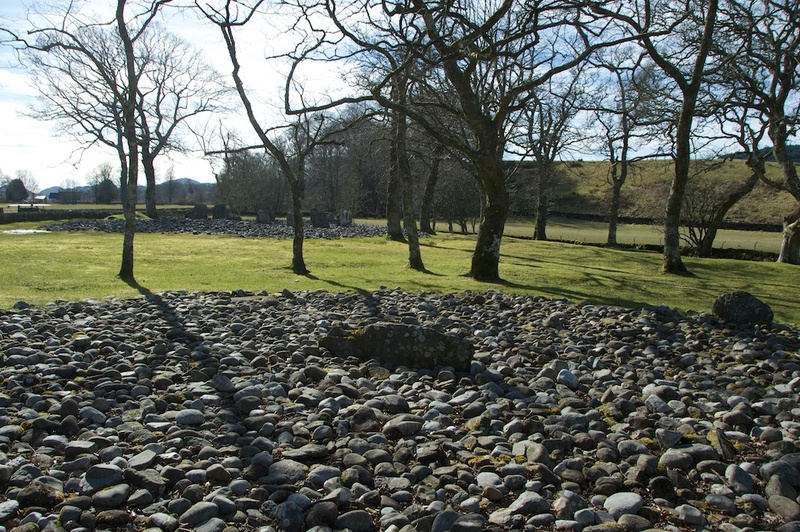 I can imagine the people of the Bronze Age, burying their child with sadness and reverence… but how connected did they feel to a stone circle that had been put up perhaps a thousand years before? And if they could feel that connection strongly, and understood why it was there and what it was for, at what stage did their descendants forget? Perhaps there are still clues to be had, although you need a certain amount of imagination. While the trees around Temple Wood are a comparatively recent addition, it’s interesting to note their behaviour. 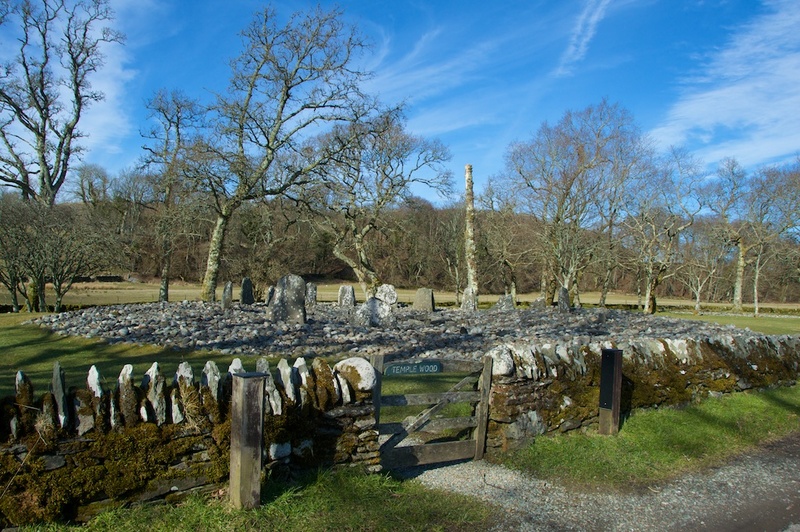 Some of the oaks are bending over the stone circle as if their branches are being whirled into some kind of unseen vortex, while a group of smaller trees – mountain ash, I think, although they were bare of leaves – are leaning in unison towards the site, like worshippers hurrying for the church door. 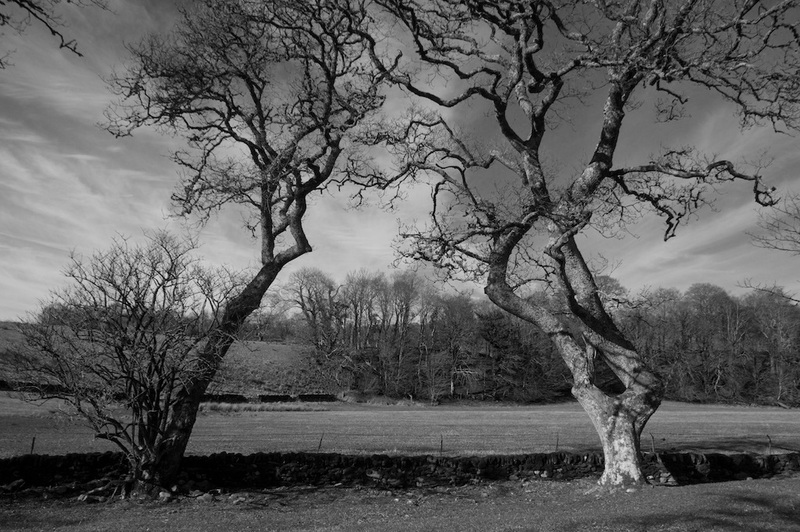 On the field boundary, two oaks appear to be whispering together, their trunks forming an incomplete arch, which makes you wonder what lies between them. My dowsing rods might have come in handy, if I’d brought them. But sometimes I think it’s just as rewarding to sit or stand quietly, and observe. Another question that occurs to me is about the cobble stones. They must have been gathered from a not-too-distant shore, but why? 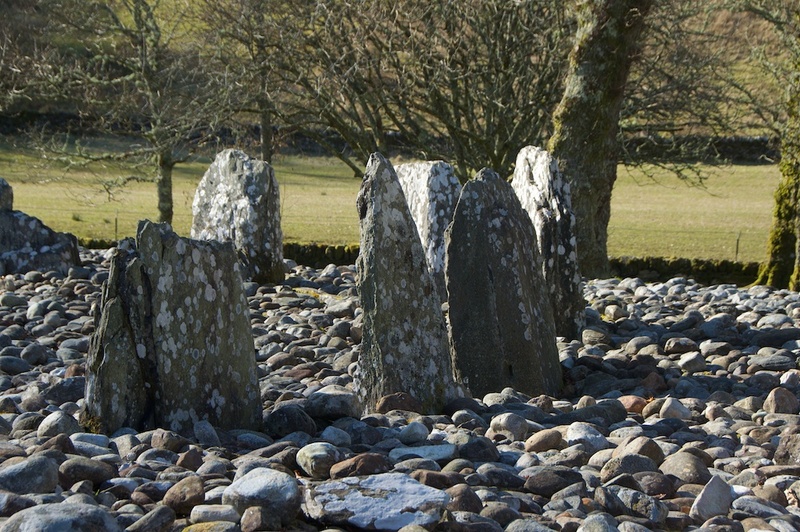 Did wave-rounded stones have some kind of harmonious energy? Was it just that they were more plentiful? Were they chosen for their pale colour? They give a strange experience as you walk around, because your footsteps crunch a little, making you feel like an intruder. And, of course, that is what you are. If Einstein is right about time – and who am I to argue? – then perhaps it is all still going on in there, and even if we can’t see it, the trees certainly can. 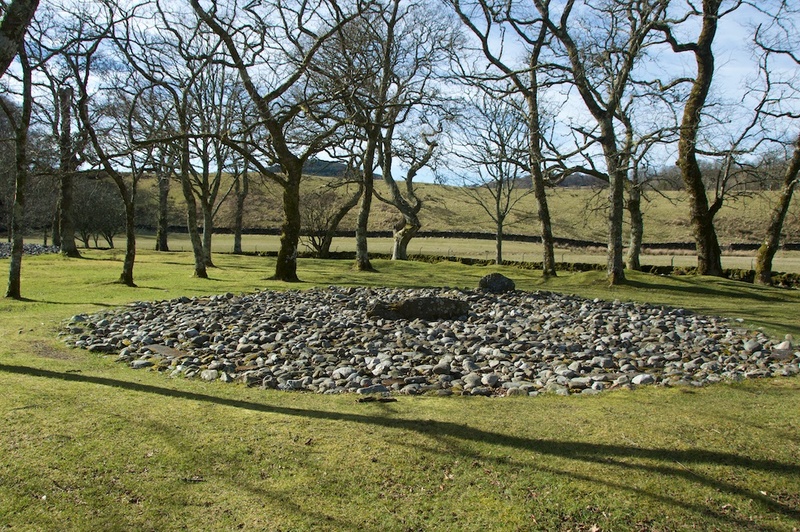 In a field close to Temple Wood lies the chambered cairn of Nether Largie South; it is so called because it is one of five cairns, stretching for several hundred yards in a straight line down Kilmartin Glen. Four of them date from the Bronze Age, but the fifth, Nether Largie South, is even older, and it is still possible to crawl inside. I’ll tell you about this soon! Dunadd – behold the king! I’ve never seen anything like that before, how extraordinary. A pity you didn’t have your dowsing rods with you but you took some beautiful photos. As you say a place to just take time to be at peace……there is a good deal of nonsense about working to achieve inner peace – but all you have to do is sit and the peace will come to you. You have to wonder just how busy this Glen was so long ago. As always another good read….we learn something new even though we know the location well. Great article, Jo. Those cobble stones are so unusual. Smooth stones like that have always seemed peaceful, although their creation is anything but. To hold one has always felt relaxing. Can’t know what the ancient peoples felt, though. The leafless trees work well in black and white. Absolutely fascinating. Thank you for all your hard work researching photographing and writing. I smiled at the tautological inhumation burial. Brilliant, Lynne! 😀 Why didn’t I think of that?! My sister-in-law lives so close to all this that it’s literally “out the back”. It’s a truly enchanting place, but there is something about the cobbles that are uninviting. Almost as if one is being asked not to walk on them — of so it seems to me. Yes – I do know what you mean. It’s just not comfortable. How lovely for your sister-in-law to have this place so close that she can see it in the early morning, dusk, moonlight…! And the rain, of course! Brings back memories of visiting this wonderful place. Great post and photos!! Thank you! 🙂 Yes, it’s a very special place, a lovely kind of energy there. Great article Joanne, keep them coming. I’ve heard so much about this place but have never been there. What a fantastic write-up, Jo, and the pictures are excellent. Thanks very much, Alen! 🙂 We’ve been driving through Kilmartin Glen for longer than I care to admit, getting whisked past all these places – glad I finally got to explore them. There’s definitely ‘something’ here – you can feel it. Did it come before the ancient sites, or because of them?! Pingback: Wordless Wednesday – Another Favourite Place | DAVID OAKES -IMAGES.